Good evening! Jess here with my second card of the month featuring as many Hero Arts products as I can squeeze onto a card! 😉 I’m also playing along with our current challenge, A Bit of Sparkle! For once I decided to go a little subtle with my sparkle…I know, I know…totally crazy for me! Ha! I’m pretty excited that the only non-Hero Arts products on this card are the white and grey cardstock, clear wink of stella glitter, and the black ink! Everything else…totally Hero Arts! 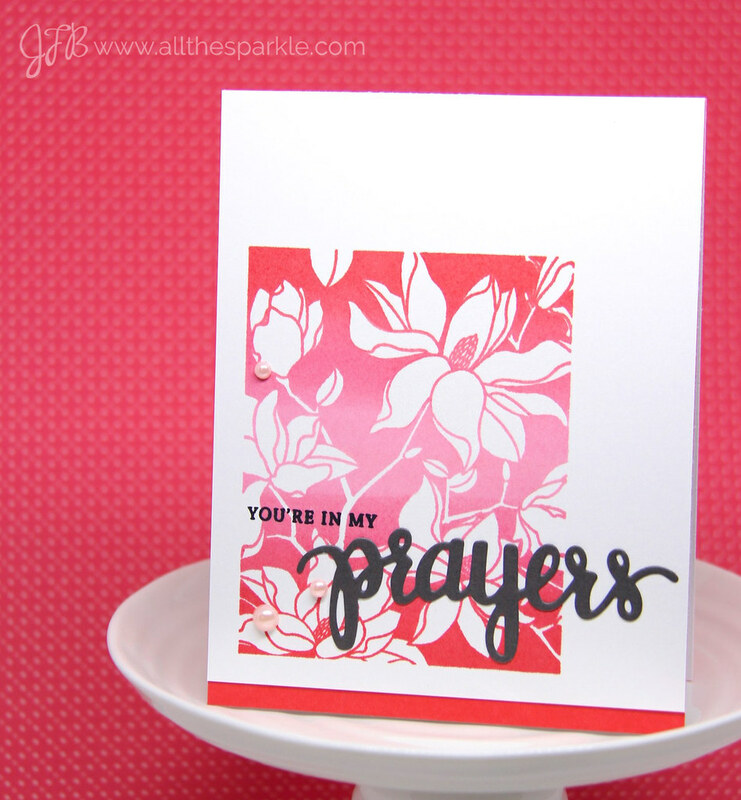 I started off by inking that pretty background stamp with the pink to red ombre ink pad and using my Misti to stamp it on a piece of white cardstock. I let it dry for a minute and then stamped the small part of my sentiment using black ink. Next I colored the white parts of the flowers with my clear wink of stella glitter brush. I die-cut the word “prayers” from dark grey cardstock and glued it to my card panel. Finally I trimmed the panel, added it to a card base of Hero Arts layering paper and added a few blush pearls for a little extra shine! I will definitely be going back and making more of these cards using all the ombre ink pads from Hero Arts! lovely card, Jess – really like the design! What a beautiful card! Love that big die-cut sentiment!